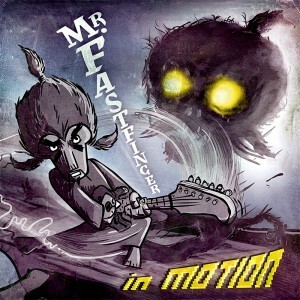 Mr. Fastfinger’s “In Motion” is by far the most unique and captivating instrumental albums I have ever listened to. The artwork was enough to intrigue me; the actual music is of the same standard. In this album, ambience is emphasized greatly; this becomes increasingly evident in the introductions to Unravel, Lost World, Super Sinister, Motion Beat, Beach Turtles, Mountain Mover, and Little Wind, and Dragons & Ghouls especially. Each track is designed to not only be musically unique; its main intention is to put the listener into the realm of our hero as he battles dark forces, or entering a lighter part of his journey. By beginning the CD with Unravel, I began to understand the motif. This particular song is one of many build ups throughout the album; Unravel in particular, however, is the album’s hook. The song is littered with impressive runs, with ample room for building. Fastfinger’s unparalleled bending technique is impeccable, which becomes evident after listening to the exoticism and original flavor portrayed in Unravel, as well nearly every other song as well. My personal favorite track, however, is Beach Turtles. The sound of waves crashing complemented by an exuberant bass line and wisely conservative licks creates a melody is understood and appreciated in any tongue. I rarely give listens to instrumental albums; even as a guitarist I find myself needing vocal accompaniment for proper expression. This particular album, however, is an obvious exception; storytelling ability with this type of capability is truly unparalleled. I enjoyed the concept of a story and battles taking place expressed by music; much like Tenacious D.
Any guitarist would appreciate this album, but it does not take solely a guitarist to appreciate it. Anyone with musicality and a sense of adventure would find themselves riveted by Mr. Fastfinger’s work, which is why I have so much to say about it. I can honestly say that never in listening to another artist’s music have I come across a piece as unique and out of this world as this. 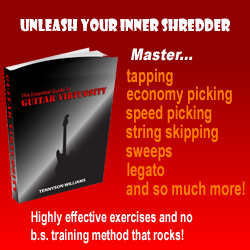 There’s nothing more that I can say about it than that it is essential to any guitarist or musically inclined person to have in his/her collection! Thanks for letting us know your thoughts on the album Colin, I can see this one flying off the shelves. Mr. Fastfinger is a big favourite of ours at Shredaholic!